Help us to serve you! Order the Page Plus Monthly Plan - Load To Phone and we will take care of loading the pin for you. Order the Page Plus Global Calling Card from here. 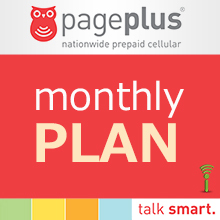 Choose from any of these Page Plus monthly plans that's just right for your phone needs and perfectly fits your budget! No additional charges for calls within the U.S. International calling is available, contact carrier. Standard rates will apply for roaming, international voice, and international texts. Online: Login to My Account at www.pagepluscellular.com and follow the instructions. Call PagePlus 24-hour automated system at 1-877-359-6695 from a landline. Call PagePlus Customer Service at 1-800-550-2436 (Mon-Sat: 9:00 AM – 10:00 PM, Sun: 12:00 PM – 6:00 PM; All times EST). Page Plus Cellular gives prepaid users the power of ultra-low rates in a phone that will work practically anywhere. Low prices and great service on the CDMA national network, added to an ever-increasing feature set, make Page Plus Cellular one of the best choices for practically anyone looking for prepaid service.